Apologies for lateness of this ‘chat’ – the Lake District and Wimbledon have got in the way a bit! The South West Summer Relay Series is well under way now, and our teams did us proud on Sunday at Sarum’s Moonraker event. Jolyon has reported on this already in a post, but it’s worth repeating that our Raiders team (Dale, Jason and Rob) came 3rd out of 21 teams, and our other, heavily age-handicapped team (James, Emma and Jolyon) came a creditable 9th. We also had a WSX Girls team (Yvette and Lyra) who came a close 2nd. Well done to them all. This coming Sunday there is WIM’s Furrow Hopper’s relay at Gillingham (no furrows there!) and we have one team entered. There are individual runs available though for those not in a team. Mondayevening we had a really pleasant Club Night at Littledown, organised by Jason, and although there weren’t many people there, everyone enjoyed the Mass Start, triple-loop format that had been organised. James Crickmore won. Over the last weekend, several WSX members went up to the Lake District to take part in the Saunders Lakeland Mountain Marathon (SLMM) event near Loweswater. The weather was really kind to us, with only a few hours rain in the overnight campsite before cooking our evening meals. It gave us all time to have an exhausted nap! 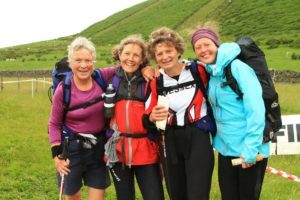 The WSX teams were myself and Nicola Brooke, Laura Wilcox and Penny Horn (non-WSX) who entered the Wansfell course, and Ian Sayer and Tim Houlder who did the course above, Harter. There were also some other friends from WIM who also did the Harter, so that at the overnight camp we had a nice social gathering of 12 people. To give you some idea of what the event entails, the distances and climb for Day 1 were: Wansfell 14.8k 850m; Harter 15.8k 1030m; and Day 2: Wansfell 10.9k 620m and Harter 12.4k 870m. The top runners (those on the Individual Klets course had 26.5k 1905m and 20k 1100m on Days 1and 2 respectively! But don’t forget that these are the straight line distances. Nicki and I, for instance, did 18.25k on Day 1 (compared to straightline distance of 14.8k). Here’s a photo of myself with Nicola, Laura and Penny at the finish of Day 2. It was a great weekend, very sociable, and I know that some of the other girls are already planning to go next year. Don’t forget that WIM have an event in Wimborne Town centre tomorrow – see their website for full details. …..we’re sadly saying goodbye to Frida Forshallen as she is moving up Farnham way after getting married in Sweden in a few weeks time. She’s been a great club member – and one who’s brought the average age of the club down considerably! I’m sure we’ll see her again at future events – and she’s staying a Wessex member until at least the end of the year. We wish her every happiness in her new life.